I'm sure this has been asked many times but the forum's advice would be appreciated. I've had a new set of boots fitted to the Disco today, decided to go for something a bit more aggressive as I do quite a bit of country lane driving and winter can be difficult here in the far SE. After doing my homework and reading quite a bit on here I went for th GG AT3, 255 60 18. I've just checked and adjusted the pressures to 2.3bar front and 2.4bar rear but they look a little soft. Should the pressures be left as per the handbook or should the pressures be raised a little. Thanks. 57 Golf Gti 2.0 Turbo. 95 Honda ST1100 Pan European. I don't have any personal experience, but believe I read somewhere that increasing the pressure a little helped. Would love to see a photo of your new wheels as I'm considering the same size and brand! They do look good, I'll post a photo tomorrow. Good deal to, £580, new valves, balanced and 4 wheel alignment. 57 Golf Gti 2.0 Turbo. 57 Golf Gti 2.0 Turbo. I run mine at 35psi front and 45psi rear but i do tow a lot and carry some heavy loads a lot of the time. 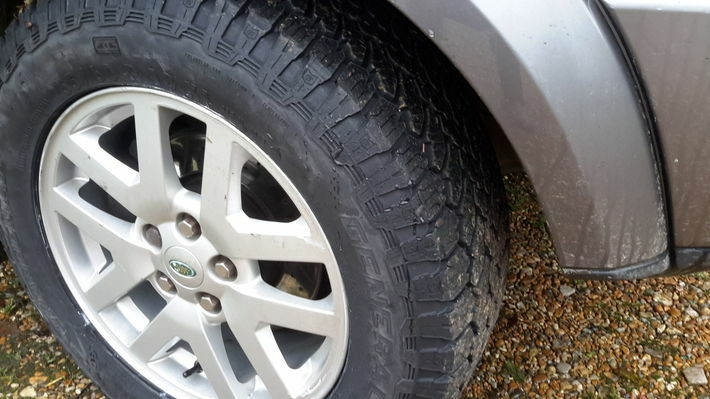 Have done about 30,000 miles like this and have good even wear all across all tyres. Pete. IID, webasto software and workshop facility's available. Thanks Pete, I've incresed the fronts to 35psi as you suggested but only incresed the rears to 40psi, definately feels better. If I have do anything heavy I'll put a bit more in the rears. Wills. 57 Golf Gti 2.0 Turbo. I would think 40 is much better for everyday use, as I use mine for work regularly that’s why they are so hogh IID, webasto software and workshop facility's available.